The State Board of Community Colleges has adopted a strategic plan to guide the North Carolina Community College System through 2022. By 2020, 67% of jobs in North Carolina are projected to require postsecondary education. Yet in 2015, only an estimated 48% of North Carolina's prime working-age (18-64) adults had a postsecondary degree, certification, license or other credential of workplace value. In response to this urgent need to significantly increase educational attainment, the State Board of Community Colleges initiated a strategic planning process in February 2017. The process involved board members, NCCCS staff, and faculty, administrators and students from community colleges around the state. The board adopted the strategic plan on Feb. 16, 2018. 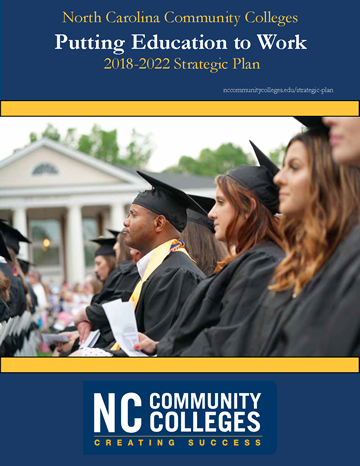 We express our thanks to the community college leaders, faculty, students, businesses and partners who contributed to the development of the NC Community College System strategic plan. Thank you, also, for helping the System achieve these goals.